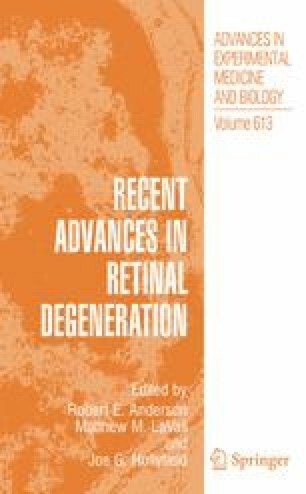 Age-relatedmacular degeneration (AMD) is the leading cause of acquired blindness in the elderly population of industrialized countries (Klein et al., 1997; Vingerling et al., 1995; Leibowitz et al., 1980). Characterized clinically in two stages; ‘dry’ AMD consists of deposition of drusen under the RPE, particularly in the macular region, while ‘wet/exudative’ AMD consists of formation of new, invasive blood vessels originating from the choriodal vascular bed. Dry AMD can lead to vision loss due to geographic atrophy and photoreceptor loss, but most patients with drusen do not suffer loss of vision.